The 2017 Tour de Cure was successfully completed on Saturday 1st April with the 1270km and 9 day bicycle ride concluding in Hobart. The annual ride for cancer research ended with much fanfare as the local fire brigade welcomed the riders with a fire hose water archway and police escorted them to the finish line. The Tour De Cure Organisation has reached a huge fundraising milestone this year with 2017 achieving $30 million dollars being raised over the past 11 years. The organisation has funded over 250 cancer research, support and prevention projects, which have resulted in 18 scientifically recognised cancer breakthroughs. As well as funding research, many incredible cancer support projects receive funding so they can continue the important work they do with patients, families and communities. Congratulations to the organizers, volunteers and of course the riders on their fantastic achievement. 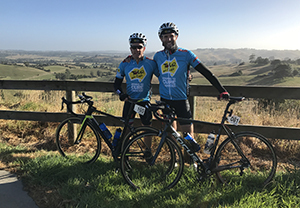 The Southern Star Group is proud to support the cause and sponsor Ben Thomas and Robbie Crumpton from Edgepoint Homes on their journey.